With PersonalizedThings by Exposures, giving personalized gifts to a die-hard Cubbies fan is a piece of cake! 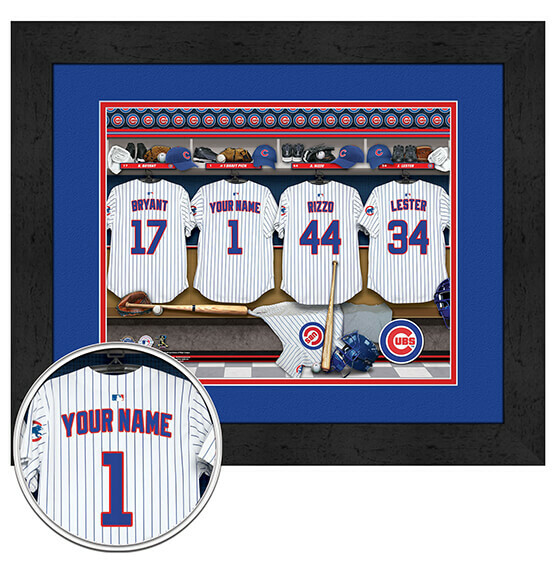 This Chicago Cubs Personalized MLB Locker Room Wall decor features any name you specify — up to 12 characters — as part of the locker room's dream team! This digital double mat print features the brilliant team colors and the Chicago Cubs' logo. It includes a sleek black high-quality frame and a sawtooth back for easy mounting. This charming custom print is perfect to give for any occasion: birthdays, holidays, anniversaries and more. It's a conversation starter that is sure to be cherished for years.